Clover and Honey—Clover and Honey floral blog with tips and flower stories. Clover and Honey floral blog with tips and flower stories. March 30, 2019- another snow day in Eskridge Kansas after a very long winter. But a little snow did not cancel the fun we had that day at Clover and Honey! In December I hosted a Christmas wreath class for 8 people. I love teaching about flowers and floral techniques and we had a blast designing wreaths with evergreens and wire frames. I always hope my class participants have as much fun attending as I do teaching! Not long after the class, one of my attendees contacted me about doing a spring class for her mother’s 50th birthday. Braydi had so much fun learning to make a wreath, she wanted to share the experience with her mother and friends. I had never made a spring wreath but I’m always up for a challenge and for learning new things so I started researching what we could use that would last or dry well, since evergreens would not be available. We used salal, Oregonia, craspedia, olive, statice, caspia, eucalyptus, eryngium, and kermit mums. In the pictures below, you will see how much fun we had! We had nine wreath-makers and everyone’s wreath turned out great! I would love to host you and your friends for a flower party! Arrangements, wreaths, flower crowns, container gardens, whatever else you can think of! If you have a birthday, bachelorette party, or any special event and want to host a party at Clover and Honey please contact me for date availability! I just got back from the Team Flower conference in Waco Texas. I signed up in November for what I thought would be a warm spring vacation where I could learn more about wedding floral design. I was wrong twice! 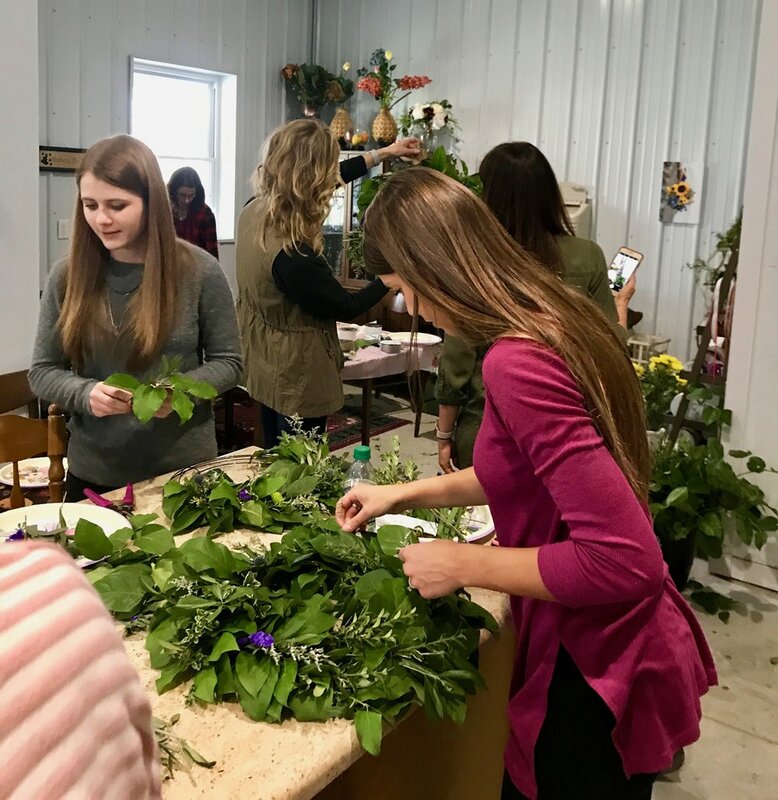 Waco had record-breaking cold temperatures last week with lows in the 20s, and I learned much more than floral design! This was a three-day conference and I arrived late. My plan was to drive the eight hours on Sunday, but Kansas had to have one last winter blizzard so I left Monday instead. The first session I attended that afternoon was Large Scale Installations by @bowsandarrows. I watched them install this entire ceremony back drop in 30 minutes! I also attended sessions on Creativity, Flower Farming, Client Communication, Embracing Change, Hiring and Managing a Team, and Art and Creativity. There were 250 retail florists, studio florists and flower farmers in attendance. The last day of the conference we walked in to this amazing flower bar. Buckets and buckets of the most beautiful flowers I have ever seen all in one place! This session was about a non-profit organization called Full Bloom @thefull_bloom. They come in after your wedding or event and repurpose all the leftover flowers into vase arrangements for hospitals and care facilities. We made over 300 arrangements to be delivered in Waco and it felt so good to be a part of something like this. The final event was a design competition by 17 participants who volunteered to share their talents. The shapes, textures, use of colors and design principles were inspiring to say the least. So what did I learn besides floral design? I learned that I do things differently than a typical retail florist shop and so do the other 249 people who attended the conference. I learned that I am part of a movement among florists to be more intentional about our love of flowers and more attentive to our customers. I like being different and following my heart when it comes to designing. I love following all the old-school design principles and mechanics, but I can do that with tons of energy and creativity in a sustainable way. I love what I do and now I embrace being different! I will always make your wedding flowers customized to you. I will double-check every detail, your likes and dislikes, things that are important to you, to make sure what I deliver is perfect. I will stay true to my style- natural, garden, organic, original. I will recycle, re-use, and reduce waste when possible, and use all resources wisely. I will use local flowers when possible, and always include something from my garden in your bouquet- a blessing from me to you. I won’t do any weddings that aren’t a fit for me personally. I love teaching about flowers- design classes, plant names, color choices, blogs. I will obsess about flower choices for your beautiful wedding. And of course I shopped all things Magnolia while I was in Waco! Corsages and Boutonnieres- Do we need them? Do we need corsages and boutonnieres for anyone in our wedding party? Remind me again what they are? And why is boutonniere so hard to spell? What are boutonnieres and corsages? A corsage is a small bundle of flowers that is pinned to the lapel of a woman's clothing or tied around her wrist. Taken from the French word for buttonhole, the boutonniere is a small, single flower or the grouping of two or three flowers worn on the lapel of the groom or the other men in the ceremony. Traditionally everyone in your wedding party wears or carries flowers, but you are free to make your choices on this one. In most weddings I’ve done, groom and groomsmen wear boutonnieres that match what the bride and bridesmaids are carrying. Beyond that, there are lots of options. Most couples either don’t know the full count yet of what they will need or haven’t even thought about this question. Here are some things to think about. Corsages and boutonnieres are a way to honor important people in your life. If your families and friends don’t really know each other, and they see someone at the reception wearing a corsage or boutonniere, then they know immediately that person is someone special to you. Personal flowers, like corsages and boutonnieres, are a way to identify the people guiding the service, i.e. ushers. At large weddings, it’s nice to know who to ask for information. Other personal flowers could be flower crowns for flower girls or tiny boutonnieres for the ring bearers. So groom, groomsmen, ushers. Who else? Most importantly- moms! They do so much work to help plan your wedding and their only reward is a beautiful corsage! Also grandmothers, fathers, grandfathers, readers, musicians, candle lighters, hostesses, personal attendants, officiants……. you get the idea. Anyone you want to honor and recognize. With so many important people, where do you draw the line? Totally your choice. There is no right or wrong. While I enjoy making corsages and boutonnieres, they are a lot of work. Kind of like tiny little flower arrangements that take a lot of abuse through the day, and need to be sturdy enough to last. I love the creativity of them and definitely try to put some character into each one, thinking specifically about who I am making it for. Please let me know if I can help you plan your beautiful wedding flowers. My favorite part of the process is meeting you and discussing all the little details! How to spell boutonniere- one t, two n’s, one r, lots of vowels. I am so thankful for all the brides I worked with in 2018. I learned so much from each and every one of you! I will admit there was a time early in my floral career where I was afraid of you as a collective group. I had heard so many negative stories about the crazy ones, the picky ones, the mean ones. But I quickly figured out that you are not all the same, and you are really just nice people trying to plan a stressful event. I love being able to help you by making your wedding flower decisions easy, and I strive to offer over-the-top customer service. So thank you to all of you awesome people for making my job easy and fun! This is how I plan your flowers. Hot tea, cookies, and inspiration. I spend hours (literally) choosing your flowers, writing quotes, ordering, changing and emailing. This my studio. Clean and ready for a Wednesday when flowers arrive. Before the chaos. Buckets of flowers! Ranunculus and Proteas. Orchids, roses and callas. Dahlias! This is what Thursdays look like. All the flowers have been processed, cleaned and put into buckets and into my cooler overnight. And the work begins! Buckets of beautiful flowers everywhere, and messes! Lots of scraps, tools, leaves and stems. Finally the finished product. I “try on” every bouquet and stand in front of a mirror to make sure every flower is where I want it to be. I usually make corsages and boutonnieres last because they do not have a water source and I want them to last through your whole day. They are like tiny bouquets and require some patience! Delivery day! Truthfully it is a huge relief to finally deliver and set up all your beautiful flowers, and it’s exciting for me to see it all come together. Leftovers are my reward for a long week. I enjoy taking what’s left and making something fun for my kitchen counter. So that’s what happens after we meet! I have had a wonderful year and can’t wait to meet so many more wonderful people in 2019. I count you all as my new friends and I am very thankful to have been a part of your wedding. Have you ever considered the idea that wedding flowers are a crop? They are grown in huge fields all over the world just for your bouquet. Holland, Ecuador, California, Japan, Alaska, Colombia and Kansas. Even in my backyard! As I have mentioned here before I love the idea of adding something I’ve grown to every bouquet, just a little blessing from me to you for a happy life. This year adding my own flowers has become a big challenge. I moved last fall from my house with very established cut flower gardens and a beautiful variety of shrubs for unique greenery. My new house sadly has no flowers! (I know right?) So this spring on days when it was warm enough, I started planting all the things I love and miss. Hopefully at this time next year my yard will be filled with blooms. Dusty Miller- who doesn't love pale gray fuzzy foliage? A skink- not what I wanted to see but I've been told they eat bugs. So I guess we'll be friends. Nora's first day as a freelance gardener/florist. Not a bad start- she only ate one leaf! So wish me luck, sunny skies and weekly rain! I can't wait to have blooming flowers at my fingertips when it's time to work on your beautiful wedding. If your wedding ceremony is in a church, the backdrop is already beautiful. Most churches are decorated with subtle colors, ornate crosses, altar tables, candles, etc. And sometimes churches do not allow you to add much to the altar area as far as backdrops and flowers. If this is true of your wedding just be happy that you can spend more money on flowers at your reception! If your wedding is somewhere other than a church, you may need to provide a beautiful backdrop- something behind the two of you that will frame every picture. Here are 7 ideas that work both indoors and outside. Two vase arrangements of dahlias, eucalyptus and amaranthus on a narrow table with candles made the perfect simple backdrop in front of a rustic brick wall and windows. The view from these windows at the Lyon County History Center in Emporia, KS was definitely part of the backdrop for this wedding ceremony. This wedding had a backdrop both outside and inside at the Bowyer Building in Emporia, KS. The wooden planks with two open doors we decorated with Baby's Breath wreaths. And inside, the wooden ladder arbor with the hanging chandelier we draped with a garland made with asparagus fern and salal and a mixture of coral flowers and baby's breath. This is the perfect backdrop for your sweetheart table. The greenery garland with mixed berry flowers framing a lighted M, along with a gorgeous centerpiece of anemone, protea, blackberries, artichoke and carnations was perfect for the couple's Farmer's Market theme. This is a traditional backdrop that many churches will allow you to use and decorate. The candleabra is decorated with mixed greenery, white tulips, stock and roses. This formal wedding at Mildale Farm in Edgerton, KS was mostly Baby's Breath and pink roses. We used greenery garland covered in Baby's Breath for the wrought iron arch backdrop and it was the perfect frame for this happy couple! This was such a fun challenge! This was the bride's vision of a floral curtain for the wedding ceremony in her family's barn. I used foraged branches from a maple tree, ruscus, and asparagus fern, then made strings of flowers using carnations, stock, and roses. The result was stunning. As you can see, you are only limited by your imagination when it comes to the perfect backdrop for your wedding. The options are endless! I would love to hear your ideas. It is my goal as your florist to bring your visions to life! I really do love flowers. I grew up vegetable gardening with my dad and flower gardening with my mom. I got my college degree in biology. I volunteer as an Extension Master Gardener in my community. I pride myself on knowing the names of everything I grow and use in my bouquets. I know how each plant grows and where they grow best. I might even know the Latin name. I am a Flower Nerd and I am proud of that! But not everyone is like me. When it is time to think about wedding flowers do you know the names of flowers you love? Or just know how you want your bouquet to look? Today I want to help you be a Flower Nerd so when you have that consultation with your wedding florist you will both be on the same page. Win, Win! The flowers you most likely see on Pinterest are what a florist might refer to as premium flowers. They are most beautiful in their own season (i.e. peonies in May), sometimes difficult to acquire, and always more beautiful than everyday flowers. Yes they are slightly more expensive than what you would spend on yourself normally, but this is your wedding. Your goal is to only do this thing once, so feel free to splurge just this one time. Ranunculus This is a beautiful flower with many layered petals and it comes in several colors- pinks, orange, yellow, purple, variegated and more. Ranunculus are at their best from January to May. They are available most of the year except the hottest months of the summer (end of July, August & September) when some varieties become difficult to obtain. Anemone This is the flower that looks a little like a poppy and has a contrasting center. The most popular color is crisp white with a black center, but other colors include bright red, pink, magenta, purple, and blue. Anemones are typically in season from October through May. Garden Rose These beautiful flowers look nothing like the standard rose you normally see. Their ruffled layers make them a perfect substitute for peonies and they have a lovely rose scent. David Austin in England is a famous breeder of these roses which have the character and fragrance of old garden roses and the colors that brides love today. Peach, pinks, blush, coral, pale yellow, cream, reds and white- so many options and all incredibly beautiful. And they are available almost any time of the year! Other flowers I love to include in bridal bouquets are things that add texture. You know from my photos that my bouquets are never boring. There are flowers like scabiosa, astilbe, thistle, stock, dahlias and celosia that add depth, color and character. If you look closely at the bouquets in these photos you will see herbs and berries like fennel, elderberry and blackberry, all from my garden. I always add something that I have grown to your bouquet as an added blessing from me to you. There is so much joy in flowers, and for me part of the joy is getting to know each flower personally. I hope I have encouraged you to learn a little more about what you want in your bouquet, or maybe even to start your own flower garden, so you can be a Flower Nerd like me! Sometimes wedding consultations become so routine for the professional that we forget this is probably the very first time you have planned a wedding! Everything is new to you and completely unknown, from flower costs to delivery details. The best way to get the most out of your wedding floral consultation is to gather a little information ahead of time. So let’s talk about five things you should know before you meet your florist! 1.) The estimated size of your wedding. Your florist wants to know approximately how many guests will attend and how many will be in your bridal party. These numbers give an idea of how many tables will be at the reception and how many personal flowers (bouquets, corsages, boutonnieres, etc.) will be needed. 2.) Your colors and the overall feel of your wedding. These things help us to start picturing what you are dreaming about for your beautiful wedding. Pinterest pictures of color palettes and favorite flowers/bouquets are also helpful. Is your theme Romantic or Modern? Vintage or Glamorous? Choosing flowers will be much easier with these details in mind. 3.) Who will be receiving flowers for your wedding? Of course there is the bride’s bouquet but what else? Flower crowns or bouquets for bridesmaids? Boutonnieres for groom and groomsmen? Think about who else you would like to honor with corsages or boutonnieres- moms, dads, grandparents, ushers, hostesses, attendants, flower girl, ring bearer? Connor and Hannah Kraus at Woodlawn Farms, Tecumseh KS. Garden bouquet of David Austin roses, stock, dahlia, scabiosa, and celosia designed by Jennifer Bennett. Photo by Hallie Sigwing Photography. 4.) Ceremony and Reception Flowers. There are two parts to most weddings- the ceremony and the reception- and flowers are used to decorate both. Aisle flowers or altar arrangements at the church? An arrangement with the guest book? Flower Arch for the backdrop? And centerpieces for the reception tables, buffet, bathroom, chairs? Flowers for the cake? You don’t need to know all these things before your consultation, but think about the options and bring pictures of both venues if possible. 5.) What is your budget? No idea? Because you have never planned a wedding? That’s okay but it is helpful if you have done a little homework before we meet. Your flowers will generally be about 10-15% of your overall budget. My best advice is not to cut costs on your bouquet because it will be in every photo of you, and will probably be the photo sitting on your nightstand in 50 years, reminding you of your beautiful day. Now you’re ready! Please contact me if you would like to meet to talk about flowers for your beautiful wedding. I can’t wait to see what you are dreaming! Do you know the 2018 Pantone color of the year? Ultra-violet! But what does this mean to you or your wedding? And what is Pantone Color anyway? Pantone Color is a color-matching system used primarily in the printing industry, as well as in the manufacture of paint, fabric and plastics. Each year the company holds secret meetings with representatives from around the world to choose a color of the year that reflects what's going on in the world. This year's color, Ultra Violet, wasn't chosen because it's regal, though it resembles a majestic shade. It was chosen to evoke a counterculture flair, a grab for originality, ingenuity and visionary thinking, according to Pantone Vice President Laurie Pressman. So what does this have to do with your wedding? Everything and nothing. It will be high-lighted in all the newest blogs and magazines for brides, and everywhere you shop. But the color you choose for your wedding should be something you truly love. Choose a color that makes you happy, has a special meaning to both of you, or the color of your favorite flower. You will never regret making decisions with your heart instead of following the crowd on Pinterest or Pantone. So what are your wedding colors? I would love to know what you decide!